“Death can’t reap your soul, I’ve booked his schedule solid.” My fiance stated as he sat by my bedside, his blank stare illuminated by the flickering torch light. I had no idea how I almost married such a man, someone so treacherous and deceiving. Someone who would kill their whole country just so I could live. Why would I want to live with so many lives dead for just mine? They don’t deserve to die for me; he doesn’t see it that way. He told me once that I was the love of his life, and I believed him. That was before I turned into an obsession. “Death will come for me, no matter how many you kill, I will die.” A crinkle around his eye and the corners of his lips turned up at my words. I felt sick to my stomach looking at the little smile painted on the lips of the creature sitting in my chambers. How could he still smile knowing what he did, knowing what he is about to do? I thought of my mother and sister, as I looked at him. When he met my small family he smiled at them, just like that. That smile of his melted their hearts, they loved him. My mother, my beautiful, caring, kind mother wanted him for a son-in-law. She was more than delighted when he asked me to marry him. My younger sister, my dear younger sister. She loved him as well, she thought of him as a new brother, someone to look up to. My sister, the one I loved and protected, she was my brides maid. I knew they wouldn’t be excepted from the slaughter about to happen, they may have loved him, but he never loved them in return. He only ever loved me, me who collapsed at the alter, me who was bedridden for months, me who would never get better, me who will die today no matter how many people he kills. “They haven’t died yet you know. They are to only be killed as soon as you draw your last breath, dead at the exact same time as you. Death would be to busy to even come after you.” He said this all with a smile still fixed on his face and I wanted to cry. I wanted to plead with him to stop, I wanted it to go back to the way it was before, before the sickness before anyone died. I knew it would never happen, this is my fate. “Killing others will not stop him, I will die, there is nothing you can do about it.” so please stop were the unspoken words. He only smiled wider at what I said his teeth showing. I was repulsed by his smile it reminded me of a monster trying to show emotion. “Killing others will change everything, Death can be stopped.” He told me and I knew I could not stop the slaughter. My face filled with sorrow and tears glittered my eyes. “Why can’t you let me die Phil?” I asked him almost pleadingly, the tears were making their way down my face and I was to weak to stop them. With his cold hands, Phil wiped my tears away and I tried to get away from his touch, but I was to weak to even move my head. “I love you Eliza and nothing can keep us apart, not even Death.” Eliza wept softly as the clock struck midnight, three chimes flowing through the air. By the third chime, Eliza was dead. The chimes were still ringing through the air as Death made his choice. He took Eliza’s soul right in front of the eyes of the one that tried to save her. Phil watched as Eliza stopped breathing, he watched as her heartbeat stopped pulsing in her wrist. He watched as her eyes closed and a soft sigh of relief she took her last breath on this plain of existence. Phil had no time to react, no time to blink, it barely even register in his mind that Eliza was dead, before Death came for him as well. Whether it was Phil’s time or not was debatable, but for trying to stall Death, for trying to stop the natural order, Phil’s soul is taken from his body and he is ferried to the land of the dead, right after Eliza. 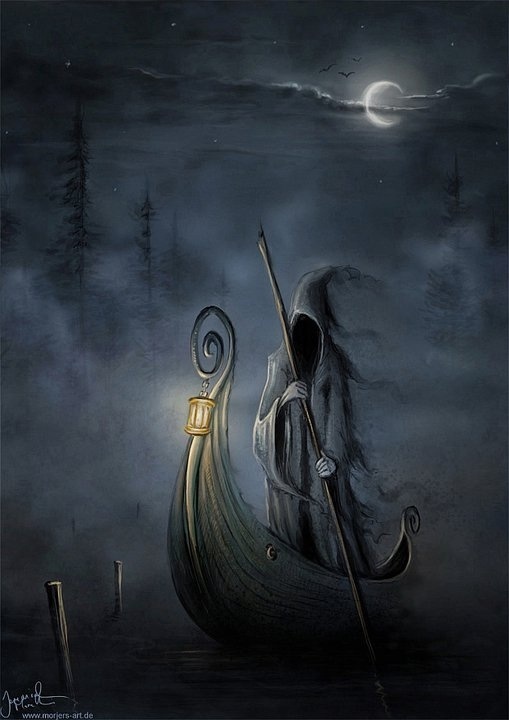 As Death was ferrying the two he neglected the entire country dying because of a very large magical spell. An entire country meant to die as soon as three chimes rang in the air, as soon as the clock struck twelve they all were to fall where they stood. This was Phil’s plan, and it would have worked had Death not chosen Eliza. Now, as the chimes stopped ringing Death came back to reap an entire country’s soul. A lot of things happened as the magic killed everyone. A grandfather held his grandson for the first time, tears in his eyes. A couple bestowed with each other kissed for the first time, they were each others first and only love. A child skinned his knee on the playground, his parents comforting him, he was surrounded by love. A florist fiddled with the bouquet in her hands, nervous to give it to the biker who comes by just to flirt with her. Death came upon these scenes and for the first time in centuries felt remorse as he took the dead to their land. He felt remorse that so many happy souls had to go from this plain of existence just for the actions of one man.